Oncology remains the most active area for dealmaking; in 2018, projected deal values increased substantially, driven by deals in immuno-oncology, and a number of major mergers and acquisitions were announced. In this feature, authors at Clarivate Analytics explore the trends in recent oncology deals. 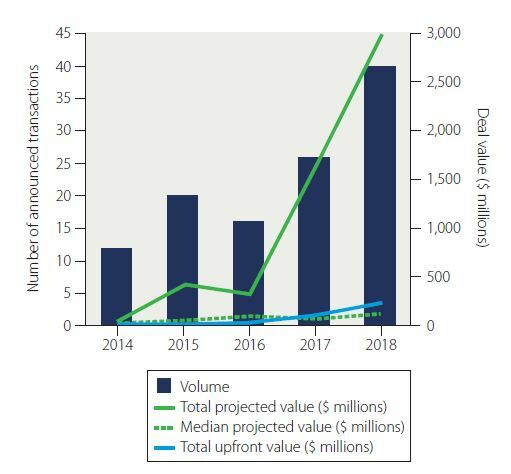 Intense competition within oncology dealmaking shows little sign of abating; the total projected value of deals signed in 2018 was more than 50% higher than in 2017 (Fig. 1) and, just days into 2019, two of the leading oncology companies—Bristol-Myers Squibb (BMS) and Celgene—announced their intent to combine operations in a deal valued at $74 billion. 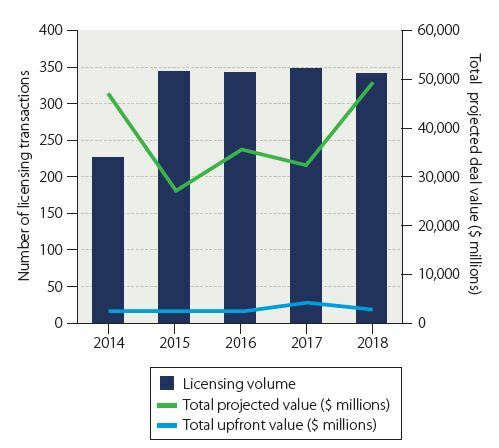 While the total projected value of deals rose substantially in 2018, the volume of licensing deals continued to be relatively stable, and much of this total value is in the form of long-term conditional mile­stones. The value of the associated upfront cash payments has not noticeably increased (Fig. 1), the exception being a spike in 2017 that was largely attributable to the unusually high $1.6 billion payout made by Merck & Co. to AstraZeneca for the codevelopment and cocommercialization of the poly (ADP-ribose) polymerase (PARP) inhibitor Lynparza. 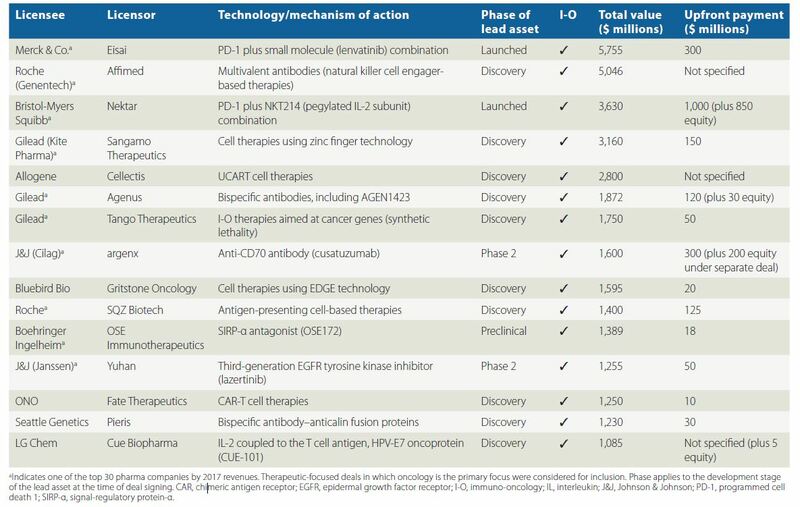 In last year’s analysis (BioPharma Dealmakers B3–B6, March 2018), the dominance of immuno-oncology (I-O) licensing deals during the last five years was noted, and 2018 continues this trend with I-O being the focus of all the deals with a projected total value over $1 billion (Table 1). Two of the highest value deals in 2018—those between Merck & Co. and Eisai, and BMS and Nektar—involve new combinations for approved programmed cell death 1 (PD-1) thera- pies, while most of the other high-value deals involve discovery or preclinical-stage assets. In addition to the continued prominence of I-O assets in dealmaking, here we highlight two other trends in partnering in the oncology field: deals to bring innovative oncology drugs to markets in East Asia, particularly in China, and deals around novel technology platforms. Fig. 1 | Licensing, joint venture and research-only oncology deals by volume and value from 2014 to 2018. Includes only deals with a therapeutic focus. For details of the dataset, see Box 1. Source: Cortellis Deals Intelligence (January 2019). The past few years have seen substantial changes in the environment for biopharma research and development and the market for innovative drugs in China, catalyzed by major regulatory reforms (Nat. Rev. Drug Discov. 17, 858–859; 2018). From the perspective of dealmaking in oncology, one key characteristic of the Chinese market has been the lack of availability of the latest generation of cancer drugs—particularly biologics such as PD-1 therapies. Recognizing this, China-headquartered companies have increasingly been licensing rights to marketed or development-stage innovative medicines from companies elsewhere specifically for markets in East Asia (Fig. 2). Although the volume and size of these deals may be small in comparison with the broader dealmaking landscape, it is anticipated that they will continue to grow in line with China’s growing health-care industry. Examples of recent deals include BeiGene’s November 2018 collaboration with Canada’s Zymeworks to develop and commercialize two human epidermal growth factor receptor 2 (HER2)-targeted bispecific antibodies, ZW25 and ZW49, in Asia (excluding Japan). Zymeworks is to receive an upfront payment of $40 million and a potential $390 million in development and commercialization milestones. Suzhou-based CStone Pharmaceuticals has recently signed two deals with US companies for oncology drugs. In June 2018, CStone Pharmaceuticals announced a collaboration with Blueprint Medicines for the development and commercialization of the kinase inhibitors avapritinib, BLU-554 and BLU-667 in Greater China. Blueprint will receive an upfront payment of $40 million and up to $346 million in milestones. In the same month, CStone Pharmaceuticals signed a deal with Agios to develop and commercialize ivosidenib (now marketed as Tibsovo in the US) for acute myeloid leukemia and cholangiocarcinoma in China, Hong Kong, Macau and Taiwan. As part of the deal, Agios will receive an upfront payment of $12 million and $412 million in milestone payments. Another China-based company that has signed multiple deals with US companies in recent years is Zai Lab. For example, in November 2018, Zai Lab signed a collaboration and license deal with MacroGenics for the development and commercialization rights of three of its oncology programs in China, Macau, Hong Kong and Taiwan, including the HER2-targeted antibody margetuximab and a bispecific molecule that targets lymphocyte activation gene 3 and PD-1. Partnerships with Western companies have also helped accelerate the development of China-originated molecules. At the end of 2018, Tyvyt (sintilimab)—a PD-1 antibody developed in China by Innovent Biologics through a major partnership with Eli Lilly that began in 2015—was approved by the National Medical Products Administration for Hodgkin’s lymphoma, becoming the second domestically produced PD-1 therapy to reach the Chinese market. Fig. 2 | Buy-side oncology therapy licensing deals by Chinaheadquartered companies. For details of the dataset, see Box 1. Companies in other countries in East Asia are also involved in similar deals. For example, in November 2018, the Korean com­pany LG Chem signed a deal with Cue Biopharma to develop and commercialize the US company’s T cell-targeted I-O therapies in Asia, including their lead product CUE-101. Cue Biopharma is eligible for $400 million in research and development milestone payments, and the deal also included an undisclosed upfront payment and a $5 million equity investment. Investment capital in the region is also maturing. For example, in September 2018, Hillhouse Capital, an investor in top Chinese technology firms, closed a new $10.6 billion fund targeting deals in health-care, consumer, technology and services sectors. This is the region’s largest ever private equity capital raise. 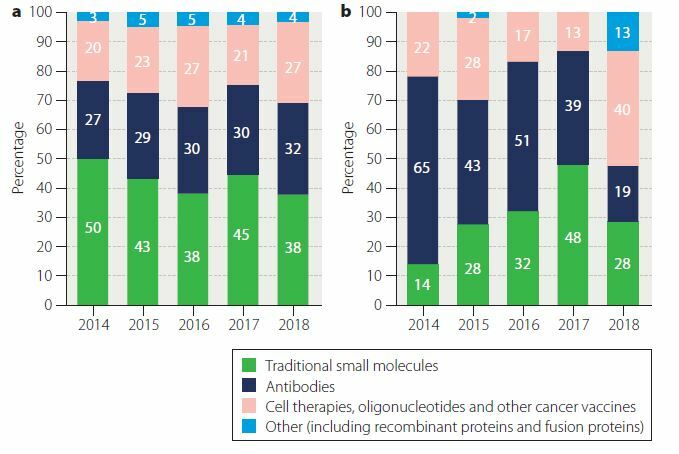 Technology drivers Newer biological technologies also figure prominently in last year’s trends, particularly T cell therapies and bispecific or multivalent antibodies. Major pharma as the principal buyer of such technol¬ogy is evident from Table 1 but, aside from this, the Allogene deal is noteworthy. The deal, signed in April 2018, involves Allogene assuming from Pfizer a 2014 deal with Cellectis to develop ‘off-the-shelf’ chimeric antigen receptor (CAR)-T cell therapies. Allogene— founded and managed by former Kite Pharma executives Arie Belldegrun and David Chang following Kite’s buyout by Gilead in 2017—is focused on building capability around next-generation T cell therapies that offer the potential benefits of allogeneicity. The company raised $300 million in series A venture funding in April 2018 and has Pfizer as a 25% equity holder. A closer look at the technologies involved in licensing deals in recent years suggests that, as expected, values cycle in line with clinical, regulatory or commercial success. Approaches using cell therapy and the administration of oligonucleotides or other antigens as immunostimulants appear to be the major driver of value in 2018. In contrast, antibody-focused deals, although still accounting for a third of all deals, appear to have declined in contributory value (Fig. 3). As noted in the March 2018 article (BioPharma Dealmakers B3–B6, March 2018), it is suspected that the 2014 deal valuations were heavily influenced by the approvals of the first PD-1 mono- clonal antibodies (Keytruda and Opdivo) and, similarly, the spike in the value of the‘cell therapy’ category in 2018 has clearly benefited from the 2017 approvals of the first CAR-T cell therapies (Kymriah and Yescarta). Fig. 3 | Technology breakdown of oncology licensing. Breakdown by deal volume (a) and total projected deal value (b). For details of the dataset, see Box 1. Alternative technologies are also key drivers of the larger mergers and acquisitions (M&A) deals of 2018 (Table 2). Specifically, three acquisitions were directed at oncolytic virus platforms as com- panies explore other strategies for precise delivery to the tumor. Furthermore, the highest-priced acquisition in 2018 was focused on CAR-T cell therapy: Celgene purchased its long-term collabora- tion partner, Juno Therapeutics, early in 2018 for $9 billion, not quite topping the $11.9 billion that Gilead spent on Kite Pharma in 2017. Juno itself had undertaken a series of acquisitions in recent years to build its technology base. The only other multibillion-dollar pure oncology M&A in 2018 was GlaxoSmithKline’s buyout of Tesaro for just over $5 billion, aimed at reinvigorating the company’s oncol- ogy clinical research program. Tesaro’s portfolio includes the recently approved PARP inhibitor, Zejula, and a handful of early clinical-stage I-O antibodies, including a PD-1 therapy. Eli Lilly’s 2018 purchase of ARMO BioSciences for $1.6 billion brought in a pegylated interleukin-10 candidate under investiga- tion in a phase 3 trial for pancreatic cancer. Then, in an even bigger deal at the start of this year, Eli Lilly announced it will pay $8 billion for Loxo Oncology, which specializes in developing therapies that target tumors on the basis of specific genetic defects rather than their site of origin in the body. In May 2017, Merck & Co.’s PD-1 therapy Keytruda (pembrolizumab) made history when it received a supplementary approval from the US Food and Drug Administration (FDA) for use in a patient population based solely on the presence of a genetic biomarker (microsatellite instability-high tumors). While Keytruda had already been approved for several other cancers, Loxo’s Vitrakvi (larotrec- tinib), became the first drug to be approved by the FDA following a tumor-agnostic development program in November 2018. The drug, which is approved for solid tumors that have a neurotrophic receptor tyrosine kinase (NTRK) gene fusion without aknown acquired resistance mutation, is already partnered with Bayer through a November 2017 licensing deal that included a $400 million upfront payment. To kick off 2019, BMS, ranked 12thby 2017 pharmaceutical sales, announced its acquisition of Celgene, ranked 21st. The $74 billion transaction will expand BMS’s range of marketed medicines, particu- larly in the area of hematological cancers, and inflammatory disease, as well as providing some late clinical-stage potential blockbusters luspatercept (myelodysplastic syndromes), ozanimod (inflammatory disease), bb2121 (multiple myeloma) and liso-cel (lymphoma). The deal valued Celgene at a 54% premium to its share price on the day before the deal was announced, but an additional contingent value right, which provides a one-time, $9-per-share bonus if Celgene’s ozanimod, liso-cel, and bb2121 secure FDA approval, further sweet­ens the deal for Celgene shareholders. The size of these recent M&A deals has raised M&A expectations for 2019. The internal machinations that culminated in BMS’s announce­ment likely had an impact on its deal appetite in 2018. In 2017, the company, along with Merck & Co., topped the list of top pharma oncology dealmakers (BioPharma Dealmakers B3–B6, March 2018) but signed only one significant therapeutic-based deal in 2018—a $3.6 billion collaboration with Nektar on the pegylated IL-2 candidate NKT214 (Table 1). Merck & Co. retained its position as the most prolific oncology dealmaker, and Gilead notably stepped up its dealmaking activity, including three deals worth over $1 billion, as it seeks to diversify away from its core antivirals business (Fig. 4). Fig. 4 | Oncology deals by the top 30 pharmaceutical companies*. All deals with an oncology focus initiated from January–December 2018 are included, with the following deal types: mergers and acquisitions, licenses, joint ventures, research deals, asset purchases and spinouts. *Ranked by 2017 revenues. The top 30 company Valeant Pharmaceuticals is excluded as it executed no buy-side deals. For details of the dataset, see Box 1. Source: Cortellis Deals Intelligence (January 2019). In 2018, as in 2017, most of the largest pharmaceutical companies were active in oncology; 21 of the top 30 companies signed at least one oncology-focused deal and together they accounted for approx­imately 25% of all oncology dealmaking in 2018. Consolidation among these major players (as with BMS and Celgene) may reduce the pool of buyers with deep pockets but will also put pressure on players to add depth and breadth to their portfolios. Moreover, the leading minds behind the acquired companies will likely move on to establish new innovative enterprises. All oncology business transactions with a deal start date between 1 January 2014 and 31 December 2018 were extracted from the Cortellis database. Deal “Transaction Type” for Acquisitions (100% or Majority Stake), Mergers, Reverse Mergers, Joint Ventures, Research-Only and all “License” subtypes were selected for analysis. The resulting datasets were filtered to exclude nontherapeutic-focused deals using the “Technologies” categorization. Deals in which the primary focus was any of the following were excluded: Assays, Bioinformatics, Biomarkers, Diagnostic Methods, Drug Formulation, Drug Screening, Generics, Genomics Technologies, Imaging, Instruments, Lab Reagents, Manufacturing, Medical and other devices, Radiolabelling, Service agreements and Software. Financial details are only available for 471 of these 1701 deals. The matrix diagram (Fig. 4) includes the additional deal types of Asset Purchases, Equity purchases and Spin-outs. 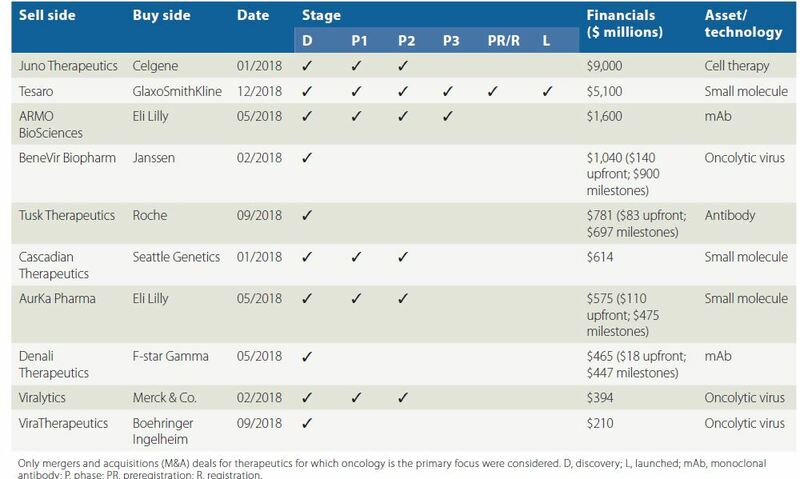 In summary, as anticipated, 2018 was another strong year for oncology dealmaking, driven in part by the clinical validation of next-generation technologies. Projected total deal value was significantly up and many of the highest valued deals involved assets at an early stage, highlighting the appetite of oncology-heavy biopharmas to invest in new approaches. There is also a continuing strong emphasis on I-O. The pace and competitiveness of oncology dealmaking shows no sign of slowing and a rise in M&A activity is anticipated in 2019. We can also expect China’s desire for access to new innovative medicines to further accelerate dealmaking in that region. Jamie Munro and Helen Dowden work in Life Science Professional Services at Clarivate Analytics.